We all know the problem of having a bag full of loose items and never be able the find the one thing in the mess. Grid-it is a black matt with elastics woven all over it. Now you can just stick the item you want under one of the bands and there it is nicely tucked away. As you can see on the picture above you can really organize almost anything this way. Things like phone, camera’s, ipod, batteries, flash drive, wires and much more can easily be organized so that now you can find them easily. Grid-It comes in two sizes so that you can use the size that fits you need. 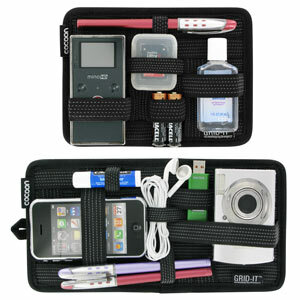 And Grid-It loves to live in your bags or just on your desk with all you favorite items needly stored. Have a closer look at all the options of the Grid-it Organizer. Lots of us these days work on laptops and that means we have a lot of wire lying around. The pictures above kinda tells a story about how my cables should look but they don’t. You see way to many cable just lying loose. But with the CableDrop this could all be organized a lot nicer. Just stick one of the clips at the edge of you desk and route the cable through it and there you are no loose wire any more till you pull it up to use it. For me this would be a great solution and I will be getting one of these. They come in a set of 6 (2 of each color) and for less the 10 dollars it seems money well spend. Check out the CableDrop Cable Clips and see how they could improve you desk.